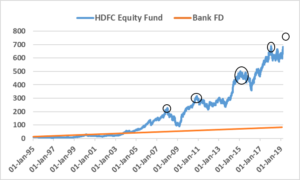 40 Years Fixed deposit Vs Sensex : A yearly rollover in a bank fixed deposit over 40 years would convert Rs.10/- into Rs.377/-, taking an average bank FD Rate of 9.5% over the past 40 years ending March 2019. The sensex, in the same period would convert Rs. 10/- into Rs.3867/-. That’s a difference of more than 10 times to your wealth in 40 years! 25 Years Fixed Deposit Vs Mutual Funds : Four of the best managed Mutual Fund schemes in the industry have completed around 25 years of performance and on an average have compounded wealth @ 19% per annum. So, while a fixed deposit would have converted Rs.10/- into 97/-, any of the 4 Mutual Fund schemes would have converted Rs.10/- into 774/-, a difference of 8 times to your wealth in 25 years! As you can see from the chart above, the 19% returns did not come in a linear fashion. Returns from Equity markets are erratic but in the long term reflect the growth in the economy and in the profitability of the underlying companies. During the journey there will be phases of low or negative returns followed by a big corrective surge (circled periods) that would make newer highs and compensate returns for the entire period!